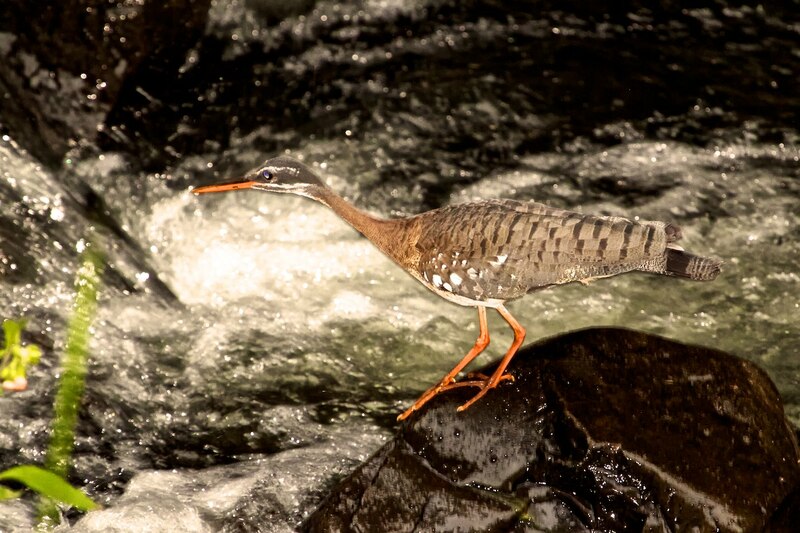 The least common bird that I was able to photograph on the Caribbean slope of Costa Rica was the Sunbittern. 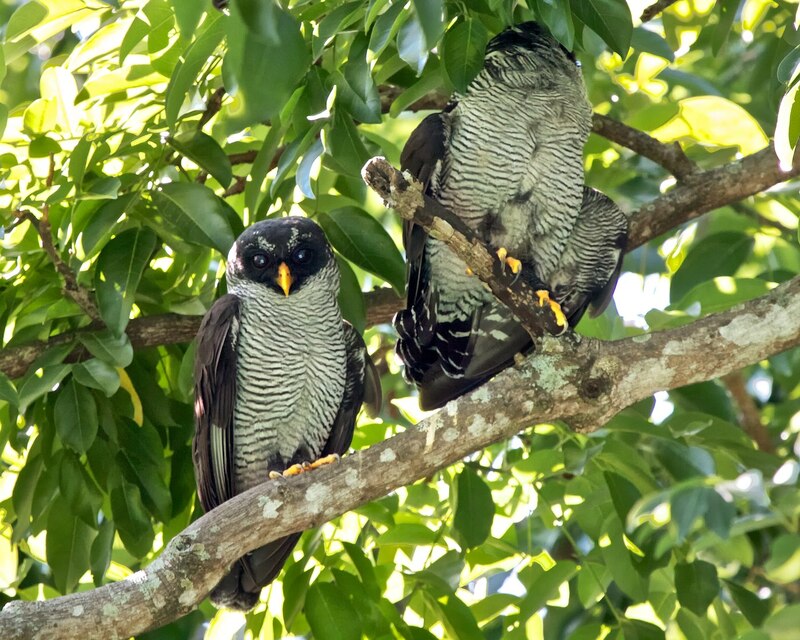 I had seen one two years ago at Canopy Lodge in Panama, but didn’t appreciate it or understand why it has the name it does until nearly the end of my tour of Costa Rica. Late one afternoon, Glenn guided us to a roaring creek where he had seen them earlier. 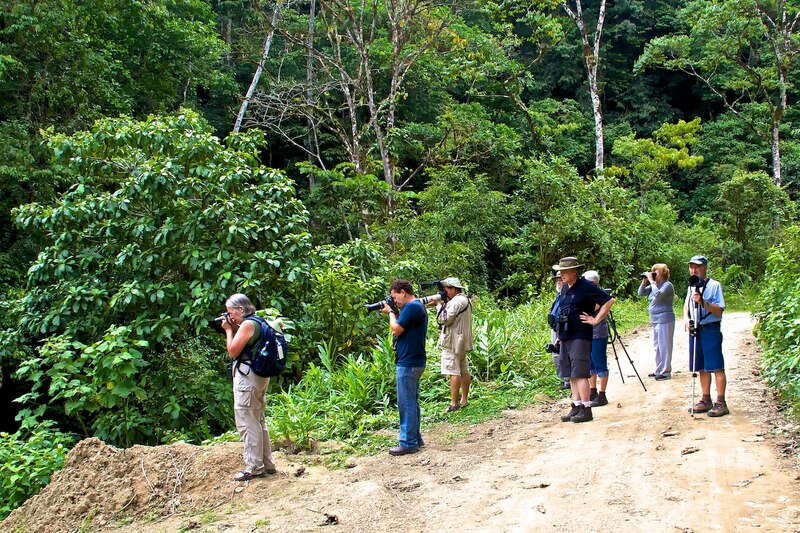 Here below are all the important members of our tour group watching this bird. From left, Sharon, Niño with Don’s camera, Glenn with one of mine, Win (partially blocked), Don, Jo (partially blocked), Joan, and Bill. 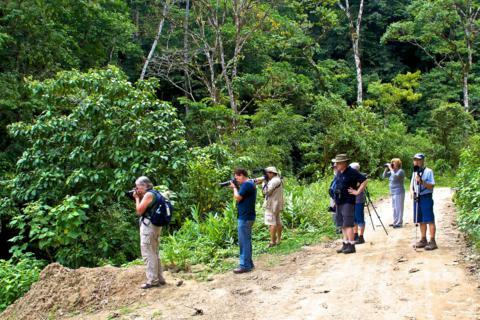 When we reached Rancho Naturalista we came to a different side of Costa Rica. While we were still in the mountains, we had moved from the Pacific to the Caribbean side of the country. This was a somewhat wetter side, and we experienced a few showers, but nothing that got in the way of our trips or ever wear the raincoat that I had brought just in case. 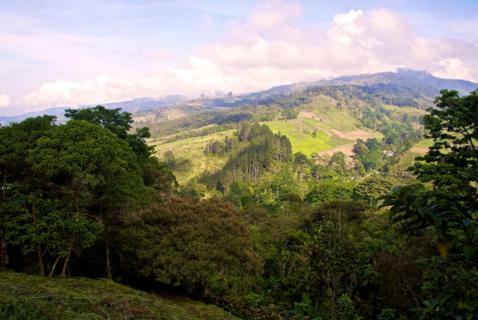 This wonderful lodge sits just below 3,000 feet, 12 miles from the town of Turrialba, and just east of the Cordillera de Talamanca, the mountain range that includes Costa Rica’s highest peaks. An American family owns this small lodge, which is situated on 125 acres of protected rainforest. From the highway it’s a 10 minute drive up a steep, rough dirt road. This is truly an ecolodge with wildlife, flowers, and trees all around. It has just 14 rooms, and for the first two of the three nights we stayed there we were the only guests. The main building is in the traditional Spanish colonial style. We ate all our meals in the outdoor dining area where we were out in nature as we ate. In fact, several times I jumped up from the table and grabbed my camera when I saw something special in the garden. The manager of the lodge is Lisa Erb. Her father, John Erb, bought the land many years ago. 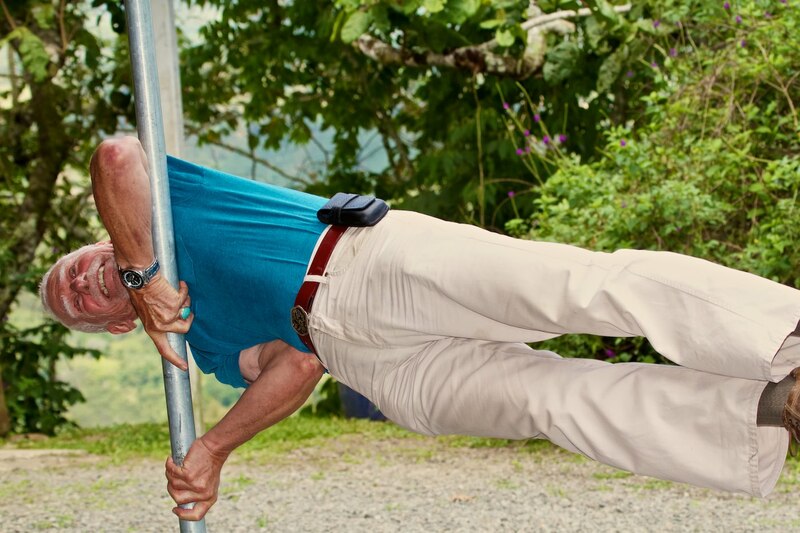 When some of us visited his home, which is a few minutes below the lodge, I had a chance to discuss one of his biggest interests, hyperbaric oxygen therapy. He showed me his hyperbaric oxygen chamber and gave me a copy of us book about how to build one. He attributes his good health to his getting a minimum of one hour of this therapy per week. In fact, he proved to me what good shape he is in when I took this photograph of him, smiling no less. Unfortunately, I cut off the bottom of his feet (but only in this photo), but I can assure you that nothing but his arms held him up. Lisa also lives near the lodge. The morning of the fifth day in Costa Rica took us from sea level to the cloud forest. Niño drove the seven of us participants and our guide Glenn in his comfortable new tour bus, which offered each of us a seat by a big window. After passing through San Jose, which is Costa Rica’s capital, we took a section of the Pan-American Highway. Then, we turned off onto a steep dirt road in the highlands of San Gerardo de Dota. We stopped for lunch at the aptly named Quetzal Lodge, where a local guide told Glenn that a pair of Resplendent Quetzals was nesting about three miles back. This was the bird that all of us most wanted to see in Costa Rica. Since the Resplendent Quetzal is near threatened, I didn’t really hope to see this beautiful bird, which many people consider to be of the world’s greatest beauties. 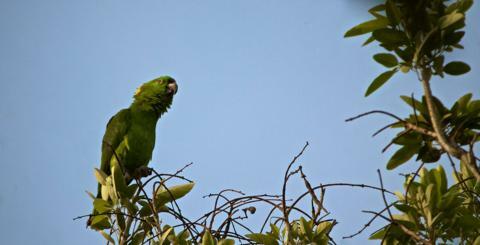 It is sacred to the Mayas and is the national bird of Guatemala. So right after lunch we drove back as far as possible and then hiked about a half mile down a steep path. The male, which has exceptionally long and beautiful tail feathers, was sitting on the nest, while the female was off somewhere else enjoying her lunch. 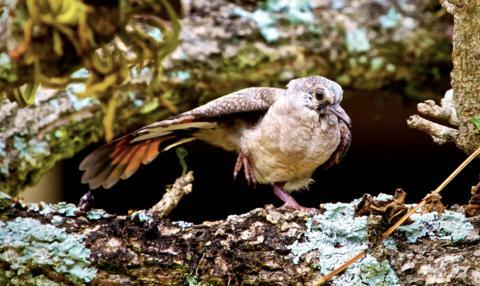 But all that we could see was his tail feathers, because the nest was on the opposite side of the tree from us. 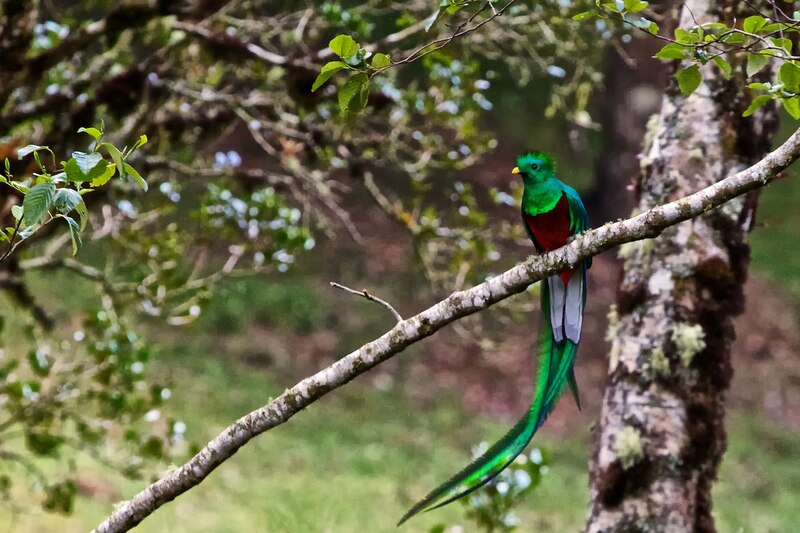 Just in case that was all that we could see of the quetzal, I took several shots and waited. And waited. Probably half an hour. We expected to see the female fly in so the male would leave to eat. But with no mate in sight, all of a sudden he flew off. We were able to follow him to four locations, at all of which I got adequate shots. Finally, he flew back to near the nest. There I got the photo that I went to Costa Rica to capture. We weren’t able to use flash, so I cranked up the ISO to 3200, which I had to do in the dim light of the forest. Since I wasn’t using flash (which takes time to recharge after every few shots), I was able to take a lot of pictures — 157 of them to be exact. Of course, the exposure was grainy, but my software took care of it quite well. At this point I told Glenn that as far as I was concerned we could stop the trip because I had already seen far more than I had hoped to see in Costa Rica. Nevertheless, we drove on. At once stop a little bird got in a fight with itself. 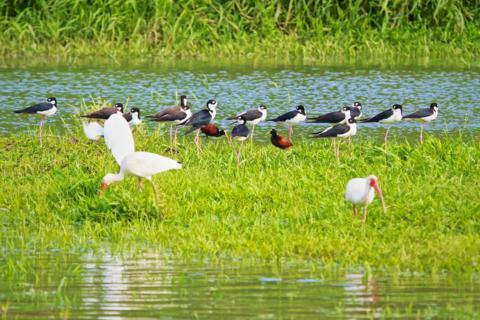 A highlight of my tour of Costa Rica was an afternoon boat trip near the mouth of the Tárcoles River. We took a small flat-bottomed boat with an outboard motor up and down a river that looked like a Garden of Eden for birds — and for birders. While we had seen many crocodiles in this river earlier, they were miles upstream from here. 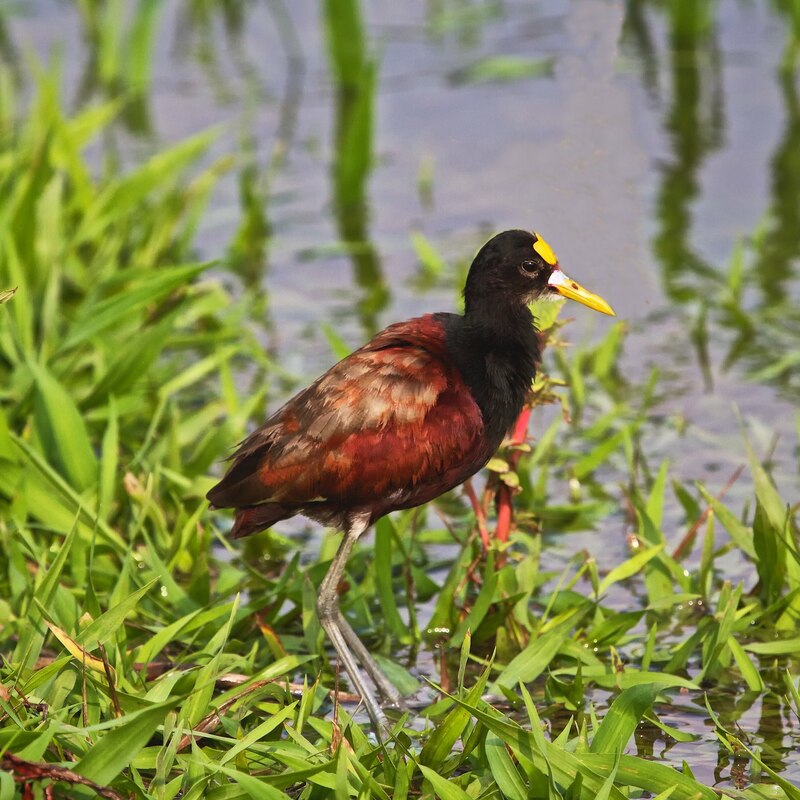 The birds that we saw in and around Punta Leone include some of the most beautiful on the planet. Macaws and other parrots, motmots, manakins, trogons, toucans and more all live there. 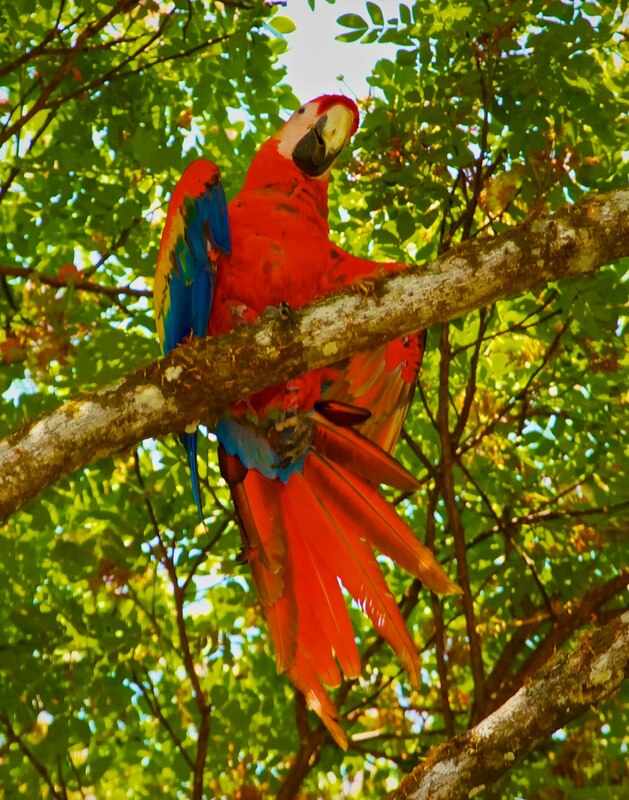 Macaws are the world’s largest parrots, and the Scarlet Macaw may be the most colorful one. 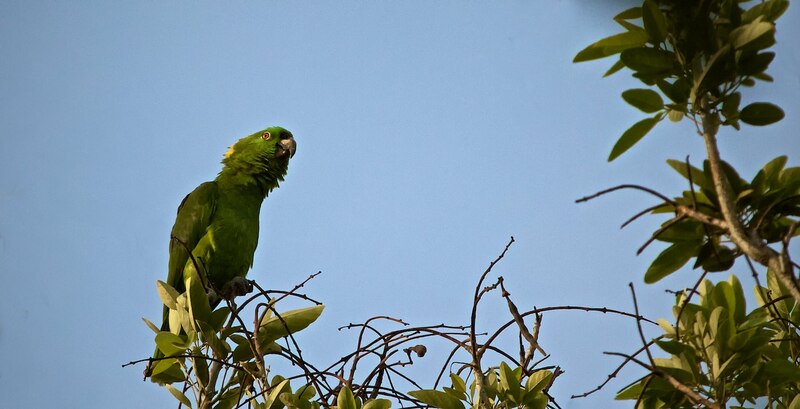 The Yellow-naped Amazon Parrot (Amazona auropalliata) Lives Near the Pacific from Southern Mexico to Costa Rica. On our second day in Costa Rica we left the city and began to explore the country. We drove about 70 miles southwest to the Punta Leone Nature Reserve on the Pacific Ocean where we stayed three nights at the Hotel Punta Leone. Our driver Marco, whom everyone calls Niño, drove his new Toyota bus for the entire trip. Niño is an excellent driver and a knowledgeable birder who spotted many birds for us, augmenting Glenn’s great knowledge. En route to Punta Leone we stopped at the town of Orotina to go birding in its park. High in one of the park’s trees Glenn located a species of one of my favorite order of birds, the owls. These are a pair of Black-and-white Owls, which I had never seen before. The smaller one is the male. Less than one hour after the nonstop flight from Denver arrived in Costa Rica at 6:15 a.m. on April 7, Sharon and I were out in the beautiful 10 acre gardens of the Hotel Bougainvillea. The hotel is just 25 minutes from the airport, and we stayed at this modern, comfortable hotel for the first and last nights of our trip. Just a few feet from the entrance to the gardens at the back of the hotel, the first birds we saw were a family of Inca Doves on a nest.